Thanksgiving morning, and if you’re lucky enough not to be in the kitchen wrestling a turkey, then maybe you’re reclined in front of the TV and watching the floats glide down 6th Avenue. Thanksgiving is one of the most uniquely American holidays. The day is heartwarming and kind. It’s a day when we eat and drink and watch old favorite movies and cheer in front of afternoon football. It’s a day when we come together as friends and families to celebrate, and to enjoy happy traditions. One of those traditions however, is the Thanksgiving toast, and for the family member assigned the “honor” of making it, composing that toast can seem more than a little stressful. Fear not. Whilst watching the Macy’s Parade, you witnessed a floating formula for the perfect Thanksgiving toast. 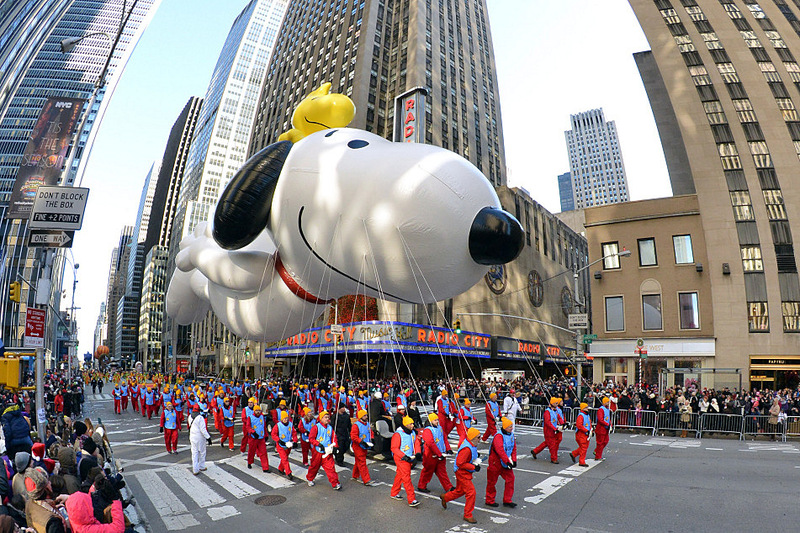 First, there needs to be a giant Snoopy – that’s something traditional. Then there needs to be a nod to whatever the latest hot children’s character is – that’s something contemporary. And above all, the whole thing needs to be wrapped around in a general feeling of childlike sentimentality – and that’s something heartwarming. Something traditional. Something contemporary. And something heart-warming — the three essentials for your Thanksgiving toast. This is the easy bit — it’s the most formulaic. There are three things you need to do. Express gratitude for the family and friends coming together to celebrate the holiday. Are there any significant people who have departed this world in the past year? — GrandPa or GrandMa, Mom or Dad, or Great-Aunt Ethel. It might seem counter-intuitive to mention the dead when you’re aiming for happy, but Thanksgiving lunch is a meal where the dead are present. Those who would once have been at the table but are with you no longer, will be in everyone’s hearts. They need a mention, and the living need to hear those names. Move from the dead, straight back into the living. There’s going to be someone vaguely panting, with red-chafed hands and hair awry. Someone who has spent the whole morning stressing in the kitchen. Focus attention on this person, and look them firmly in the eye as you thank them for their labors. This bit is slightly trickier. What are you giving thanks for? Everybody present will, hopefully, have something this year that they are proud of, or feel that they would like to mention. This is the moment for audience participation. In our family, we go around the table and everybody says a few words about what they, personally, have been grateful for this year. As you say this, look to the person sitting beside you, and then cast your glance down the side of the table along which the statements are going to flow. Let the group know what they are meant to do. It’s also a good idea to have pre-informed that first person in the chain about what’s going to happen. That way they are ready to respond. As they are speaking, others will, in turn, be planning what they might like to say. When we become tense, as so many of us do when speaking in public, we gabble. Gabbling creates tension, and tension is the direct opposite of heartwarming. You need to slow your rate of speech just a little, and the best way to do that is to smile. If you’re smiling, then it becomes a physical impossibility to gabble. You’ll look like you’re enjoying the moment, and if the folks around the table believe that you are relaxed, then they’ll be relaxed too. Lots of “us”. Lots of “we”. Lots of “our”. It’s scary how often we use “I” and “my” when we’re speaking. Natural speech is more possessive than inclusive, and at Thanksgiving, it all needs to be about inclusive. As far as you can – aim for pronouns that bring everyone together. Use “we” and “us” and “our”, whilst actively avoiding “I” and “my” and “you”. This one small but important skill will inject more natural warmth into your speech than the finest and most soaring rhetoric. Plan what you’re going to say. Practice what you’re going to say. And keep it short! Less than 20 seconds, and it’s a little too short, but more than four minutes, and it needs some editing. Remember those balloons in the Macy’s Parade. They’re light, and bright, and colourful. That’s what makes the parade such a much-loved tradition, and the same will be true for your Thanksgiving toast!